The building blocks of a Schedule start with a Work Breakdown Structure (WBS). The WBS is a hierarchical reflection of all the work in the project in terms of deliverables. In order to produce these deliverables, work must be performed. 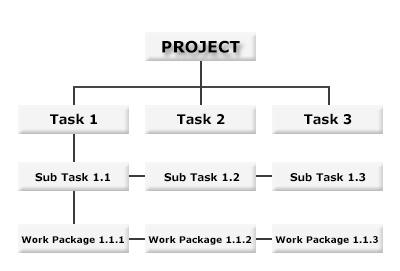 WBS is a hierarchical and incremental decomposition of the project into phases, deliverables and work packages. It is a tree structure, which shows a subdivision of effort required to achieve an objective; for example a program, project, and contract. The WBS provides the foundation for all project management work, including, planning, cost and effort estimation, resource allocation, and scheduling. Therefore, one should take creating WBS as a critical step in the process of project management.